Multi Band 6 Radio Controlled A built-in radio signal receiver ensures that the exact time is displayed across Europe, The United States and Japan AND China. Probably not as robust though, I think that's the point of these watches. if I didn't have one already is get this. bargain! I have this model G..... £125 is a very good price, even better as its about £112 after the TCB. 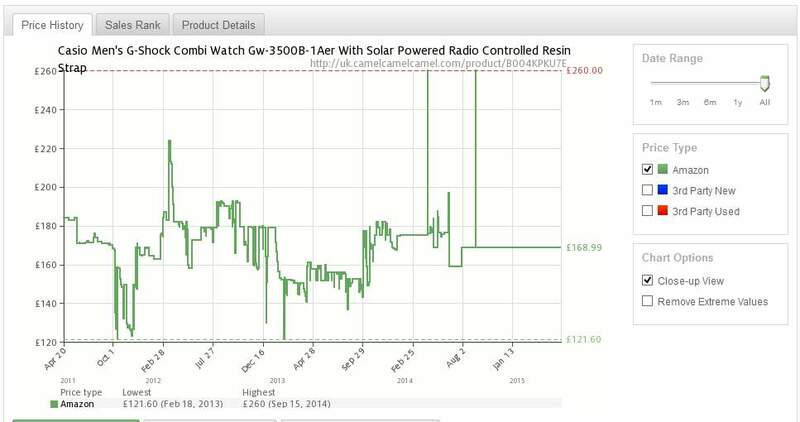 Amazon price will have to drop to £140 to match the H Samuel £112 after TCB price. Thought the fashion code had finished now ? Even if it hasn't, i'd still rather deal with HS....... Amazon have got my back up with their rip off £20 min order for free del. Which has been done to persuade people to get Prime. The problem with these watches is they are so damn robust you just dont need another one as the original is still going strong after 5 years. They are brilliant pieces of kit for people that want one watch every 10 or 20 years. Wanted this watch for ages. Was waiting for it to come down to half price. But skint, what do i do? I have the GW3000. Love it! I got the metal ECW-M300E version of this off H Samuel a year or so ago. Beware, when it turned up it was loose in the plastic envelope, was sent with completely the wrong box and had A4 photocopied and stapled instructions. Ex-display at best. After lengthy phone calls with their customer services I ended up having to take it to a branch in Croydon and swapping it for one that was at least in the correct packaging. Their quality control is very poor on mail order. Really love the quality of this watch. But one really negative complaint that I have is the "auto" time calibrating. It doesn't work all the time and especially in this country where we change time 2 times a year, this watch may not pick up the time changes for a few days Anyway, great watch and great price! Really love the quality of this watch. But one really negative complaint … Really love the quality of this watch. But one really negative complaint that I have is the "auto" time calibrating. It doesn't work all the time and especially in this country where we change time 2 times a year, this watch may not pick up the time changes for a few days Anyway, great watch and great price! Had mine for a few years now and when the clocks go forward or back it always changes not long after 2am on that day. Thought the fashion code had finished now ?Even if it hasn't, i'd still … Thought the fashion code had finished now ?Even if it hasn't, i'd still rather deal with HS....... Amazon have got my back up with their rip off £20 min order for free del. Which has been done to persuade people to get Prime. I know it's no longer working on bags/backpacks but should still work on watches. Managed to get a couple of Yellow GW6900 for £30 each a few years ago using the code. Here's what it says on Amazon. "If you are a first-time subscriber to Amazon Fashion emails, we will email you a unique promotional code (“Promotion Code”) redeemable for 20% off purchases of eligible Clothing, Shoe, Jewellery and Watch Store items, up to a maximum of 5 clothing, shoe, jewellery and/or watch items in a single purchase order,"
I've got one of the older varients of this watch and had it for over 8 years. Never had to adjust the time, or replace the batter, plus it's absolutely bomb proof. Had mine for a few years now and when the clocks go forward or back it … Had mine for a few years now and when the clocks go forward or back it always changes not long after 2am on that day. It should work automatically but somehow mine got some problem. And another thing is when you travel to other coutry with other time zone. Everytime I do that, I need to refer to the manual how to set the country time zone and sometimes because of the BST, it differ by one hour! (first world problem). cheeky ask, but does anyone have the £25 off voucher code they are not using? any chance someone could email it to me? I will order the watch, then pass my voucher code on, share the wealth? much appreciated if so! Nice watch....I bought this model: Casio GW-4000-1A3ER from here: nalevi.com/wat…3er recommend a friend (if you haven't got any, make one up, just needs an email) then you're entitled to discount. I highly recommend this shop, great customer service and quick delivery. Just ordered one from Amazon with the 20% code for £75 so thanks for the heads about that on this thread. 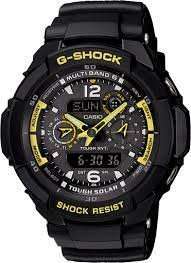 Does anyone know how long the solar cells are able to recharge until they stop all together in g shocks? I'm still trying to destroy the one I have so I can get a new one. 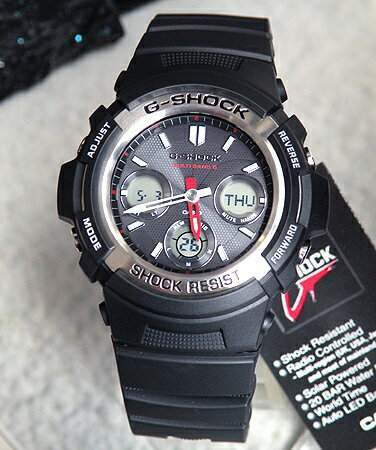 Damn g-shocks! Wanted this watch for ages. Was waiting for it to come down to half … Wanted this watch for ages. Was waiting for it to come down to half price. But skint, what do i do? ordered yesterday but tcb hasn't been tracked. ****! 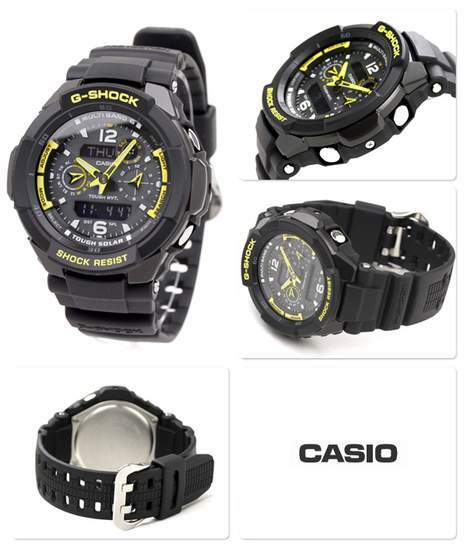 Nice deal voted hot, personally though I prefer the less fussy Casio … Nice deal voted hot, personally though I prefer the less fussy Casio G-AWG-M100-1AER Just ordered one from Amazon with the 20% code for £75 so thanks for the heads about that on this thread. TCB are incompetent at best and scammers at worst, I stop using them when it came to the point that far more purchases failed to track than succeeded. I switched to Quidco and have not had a failed track in the last 40-odd transactions. TCB are incompetent at best and scammers at worst, I stop using them when … TCB are incompetent at best and scammers at worst, I stop using them when it came to the point that far more purchases failed to track than succeeded. I switched to Quidco and have not had a failed track in the last 40-odd transactions. TCB are faster at paying out. Quidco take 2-3 times longer + you can get paid out in Tesco clubcard boost points max £50 per year TCB give you extra 5% so that £52.50 which is worth £105 or 4x that =£210 in vouchers in participating restaurants. TCB is better!!!! TCB are faster at paying out. Quidco take 2-3 times longer + you can get … TCB are faster at paying out. Quidco take 2-3 times longer + you can get paid out in Tesco clubcard boost points max £50 per year TCB give you extra 5% so that £52.50 which is worth £105 or 4x that =£210 in vouchers in participating restaurants. TCB is better!!!! Any benefits they offer are negated by their ineptitude in the tracking of purchases. The effort of chasing up failed tracking is an irritating inconvenience, at least for me. 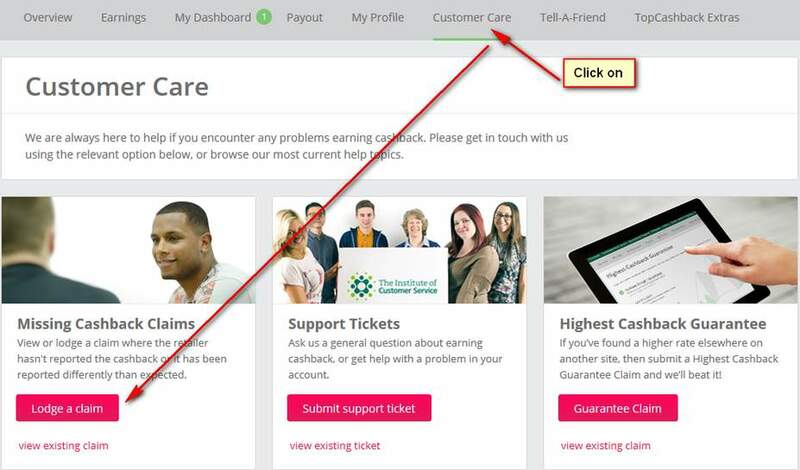 I find Quidco are consistent and reliable, they are the most important attributes of a cashback website. I tested TCB tracking a year or so ago over a period of a few months, using stock Windows installs on virtual machines, with stock Firefox/Chrome/IE browsers, I still had regular failures in tracking. I've read countless stories of others experiencing the same issues. For £5000 you can get an entry level Rolex. Couldn't resist. Now need to find a way to wear it without the missus noticing.